How was your holiday weekend? Ours did not go as planned. My mom was hospitalized again for fluid rentention in her lungs from her congestive heart failure. I'm sure she will feel much better once they get it off of her. It's hot out and hard to even believe that it's time to begin decorating for fall, but I usually use Labor Day as a marker to begin. I have been thinking about simple ways to add fall this year with texture. I prefer to do this in the early part of fall before I think about adding pumpkins in the mix. I like to add texture with fabrics and with natural items. Today I'm sharing some ways I have added it in the past. Ivy tucked in moss and then a vine draped over it added a texture in the foyer. I love adding natural items like these dried pods I picked up in different shops while on road trips. In the French style guest bedroom I filled a copper pail with some mums and winter cabbage plants. The mudcloth pillow also adds texture. Baskets and even throws are great for adding texture. More colorful pillows and a throw in last year's sun room. 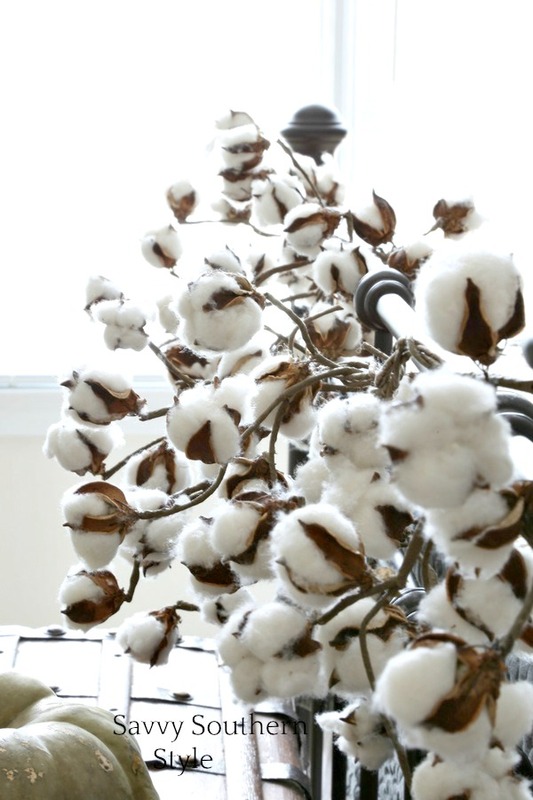 Cotton on a vine or branches tucked in a vase are great for fall. I love using feathers. This was in my dining room last year. Old books and especially those with ruffled pages are a very easy way to add more texture. Can't pass up bargains this good. Regularly this haul would have been $516 and I paid $144! It was less than the original price of the quilt. It was like getting free stuff! Adding simple things at this time of the year is perfect to get in the fall mood. I am not quite ready for pumpkins when it is still in the 90’s. Have a great day and hopefully your mom will get to feeling better soon. Remember all of your beautiful Fall decor and looking forward to seeing what you will be inspiring us with this year! Hope your mom recovers quickly! Have a great day! Loved seeing you past fall touches and look forward to seeing this years. Sending prayers for your Mom. So sorry to hear about your mom. My dad was diagnosed with CHF earlier this year. It took quite some time to get his meds regulated but he is doing so much better. I hope your mom will too. I am getting so much inspiration from your posts! 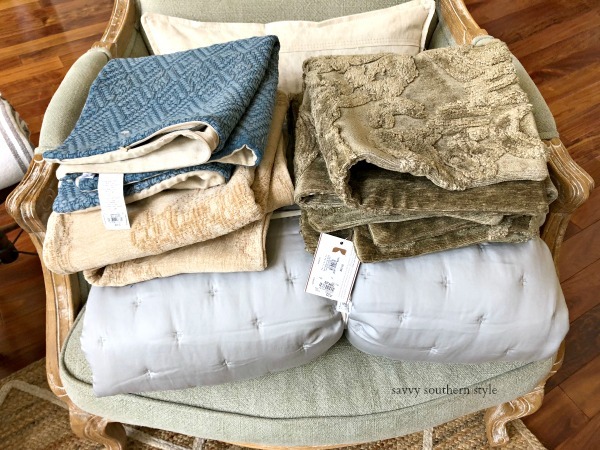 Would you mind sharing where you get your mudcloth pillows? Thank you, Jan and I find those on Etsy.